Higher education long has been seen as one of the best ways out of poverty, but connecting low-income students — even the high-achieving ones who presumably are best prepared for college-level work — with colleges and universities remains a challenge. On Thursday, President Obama is expected to meet with more than 100 college presidents at the White House to discuss ways of enrolling more low-income minority students and helping ensure more of them graduate. College enrollment among low-income students has generally increased over the past several decades, according to data from the 2013 Digest of Educational Statistics (an arm of the federal Education Department). But the Great Recession and weak recovery have eroded the gains of recent years, and middle- and upper-income students remain far more likely to go to college. In 2012, the most recent year for which NCES figures are available, 50.9% of recent low-income high school completers (a category that includes both graduates and people who completed an equivalency degree and who are ages 16 to 24) were enrolled in a 2- or 4-year college. That’s down from the record-high 58.4% in 2007, and just half a percentage point higher than the rate in 1993. 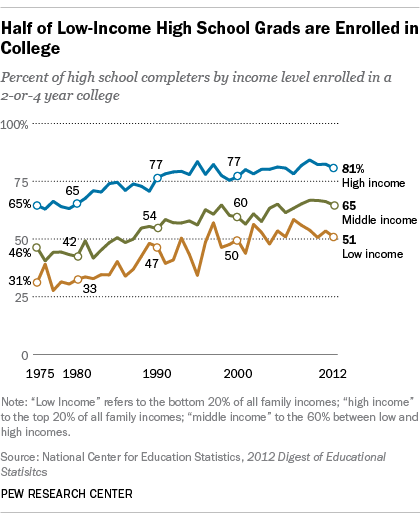 But enrollment rates among middle- and high-income students also have risen, to 64.7% and 80.7%, respectively, in 2012. (NCES defines “low income” as the bottom 20% of all family incomes, “high income” as the top 20%, and “middle income” as the 60% in between.) Looking at it another way, low-income students now are enrolled at about the same rate as middle-income students were in the mid-1980s. The 2012 data on college entry by race and ethnicity show a striking convergence: After decades of marked disparities in enrollment, about two-thirds of white, black and Hispanic high school completers all were enrolled in college. 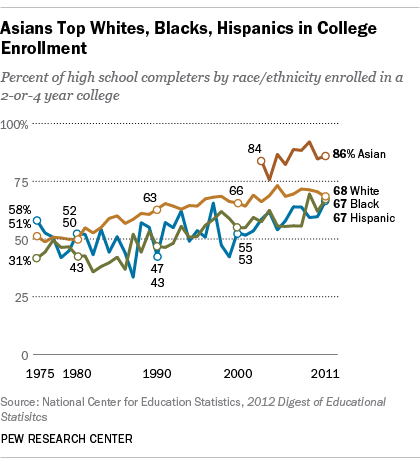 (Enrollment among Asians continued to far outpace other groups.) But significant differences remain in completing high school: As of the 2009-10 academic year, the average freshman graduation rate in U.S. public high schools was 93.5% for Asian/Pacific Islanders, 83% for whites, 71.4% for Hispanics and 66.1% for blacks.